“Sonajero”: it is known as gourd or “guaracha”. It is manufactured with the fruit of the gourd tree. Parallel cracks more or less in horizontal direction are done to the gourd, which are rubbed or scratch with a piece that is done with wire; some use forks. “Bocona or Socavon”: is a smaller guitar although less thin, it has only 4 strings and it is one of the best instruments to accompany the folkloric dances. “Mejoranera or Marjorana”: kind of long guitar made of cedar; it has five strings for its better sound. Rabel: is a native violin of three cords and as well as the violins, they are touched with an arch, this instrument carries the melody with its smooth chords. Accordion: instrument that in spite of not belongs to our region, it is a fundamental instrument of our music and it stretches and shrinks producing sounds that carry good sound and rhythm. “Pujador”: it is an instrument of deeper or lower tone, very useful as instrument of accompaniment as the sound-box and the “repicador”, where it is played, is of cow skin in the up side; in the bottom is hollow and of wood. “Repicador” [like drum beat]: is a drum with wedges, also with a patch of cow leather on one side; of high and sonorous effect and is useful for guiding couples in the dance. Maracas: are made with the fruit of the pumpkin tree to which their fruit or internal mass are removed and then filled with beans or small stones and are fit to a stick which make the function of handles that when they are shacked, produce a sound that among other instruments, make a pleasant sound. Sound-Box: it has cow skin patches by its sides; is touched with drumsticks of wood. It is cylindrical and also hollows, in case of the Panamanian sound-box, it has leather in an extreme, hitched with rope and pieces of wedges of small wood. Here is a traditional band in Panama. 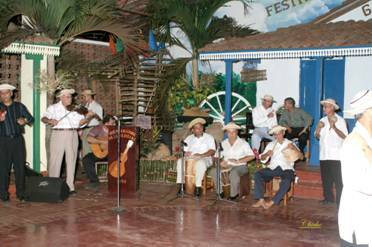 Music is very important to the culture in Panama and the Azuero Peninsula. Many famous musicians come from the towns along the Azuero Peninsula. When purchasing real estate in Pedasi, Pocri, or anywhere along the Azuero Peninsula you are never too far from a local cantina and band.